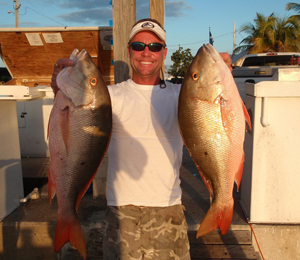 The mutton snapper (Lutjanus analis) makes for excellent food and fun when fishing Key West. The snapper puts up a great fight, so it’s a challenge many anglers enjoy. Snappers live along the East Coast and in the Bahamas, but Key West boasts many of the largest snappers, including the heaviest caught—at 30 pounds and four ounces. Most reef and deep-water snappers are adults and weigh about 5 to 15 pounds, while inshore snappers, usually juveniles, weigh from one to two pounds. The juveniles frequent grass beds, canals, coral patches, channels and mangroves. The color of a mutton snapper depends largely on its size and habitat. However, no matter the size, all snappers have blue lines in the gill cover and along their backs. One black spot marks them near their dorsal fins. Shallow-water juveniles look rosy, bright and have fins that are primarily red. Adults are mostly green on the top. On their lower sides and underside, they are red. Mutton snappers are sold fresh and frozen and labeled as red snappers. They used to make up the majority of the commercial snapper trade, but their populations have declined. In fact, the World Conservation Union has listed the snapper as vulnerable, which means that while it is not endangered, it faces a high risk of extinction in the wild past the near future. In general, mutton snappers feed at the bottom of the ocean, going to about 50 feet deep during the day. In the evening or when light conditions are not optimal, they feed in shallow water. However, their feeding habits do change as they age. Larval snappers eat plankton they find near the water’s surface. As they get slightly older, they spread to grass beds and eat small invertebrates and larger plankton. Next is a diet of crabs, snails, shrimp and small fish including mullets. Mutton snappers feed all day long, and these that tend to feed at the bottom of the ocean have color patterns of dark bars. Snapper predators include sharks and other snappers. In deep water, snappers put up a heck of a fight. In shallow water, they are famous for long runs and resistance. Major ways to get them are via boat seines, bottom long lines, hand lines, gill nets, traps and spear fishing. There are various detailed ways to catch snappers, and many fishermen have their favorites. Some prefer live bait, others claim artificial bait is the way to go, while yet others stand by dead bait. All these ways work, though, so it really is a matter of personal preference. Regardless of the bait, it should look natural and real. That means if dead bait is used, ensuring it is as fresh as possible. It also means regardless of bait, letting it stay still on the bottom of the ocean and not twisting it up and down and from side to side. Fishermen also need to be very patient because mutton snappers won’t travel in groups larger than five unless it is spawning season. A fisherman who doesn’t yet have preferences can follow these strategies: light bait such as live pinfish, pilchards and shrimp for reef fishing. For inshore fishing, spinning or bait casting tackle works great especially since grass beds, channels and rocks come into play. When sight fishing, crabs and shrimp make good bait. Flies and permit jigs can also work okay if conditions are right. Fishermen going for mutton snappers offshore must use bottom fishing or deep jigging. They need to set up a terminal tackle that doesn’t have snap swivels and wire leaders. The line must be lightweight. Mutton snappers move often, so a fisherman who has good luck one day at a certain reef might not on the next day.